Published on April 5, 2018 in general info. Closed Tags: Cape Cod Luxury condo sales, Cape Cod luxury sales, Cape Cod real estate, Provincetown luxury homes, Truro Real Estate, truro single family homes. 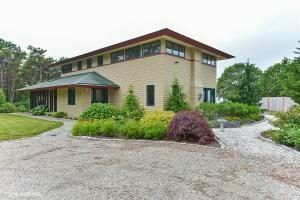 5 Parker Drive in Truro is an Alan Dodge designed home with four bedrooms and four baths in 2,696 square feet. It was being marketed for $800K and recently sold for $775K. MLS Remarks: Truro extraordinaire! Stylish Alan Dodge designed home has wonderful views of Cape Cod Bay and Provincetown from just about every room in the house. This 4 bedroom, 4 bath home has it all! Gas heat, central A/C, radiant heat under the tile floors, 1st floor laundry. The living room has Cathedral ceilings with gas fireplace, double doors lead to beautiful outside living! The kitchen is top of the line with function and style (Adler Cabinets.) Lovely 1st floor Master with private Bath. Second floor offers a full Master as well! All 3 bedrooms loft have splendid Bay Views, plus upstairs bedrooms have a private entrance to large deck. This well planned home provides great outdoor living space with mahogany decking, large screened in porch along with fire pit, pizza oven and outdoor shower. See all available properties for sale at Beachfront-Realty.com.